I can’t seem to get enough hot liquid during the winter. Whether it’s coffee, tea, or cider, I seem to have a hot mug of something in my hands at all times. This may be in part due to our extreme energy-saving heat regimen at my house or maybe just the enjoyment of looking out into the cold day while sipping something warm and feeling it warm you through. 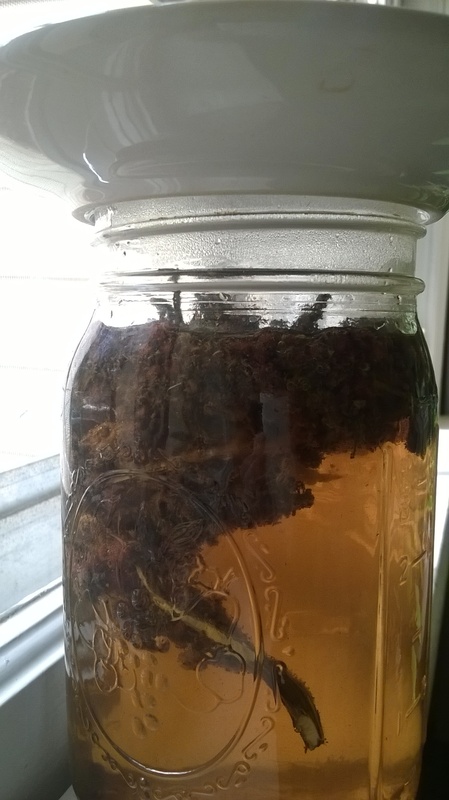 Of course, there are many herbs you can dry during the spring and summer months to be used as tea when winter comes, but there are also still things you could harvest now in the wild to be brewed into tea. These winter treasures fall neatly into our Feasting in Times of Winter Scarcity series. Many of these wild things are also high in vitamin C, something that can be hard to come by locally in winter months. 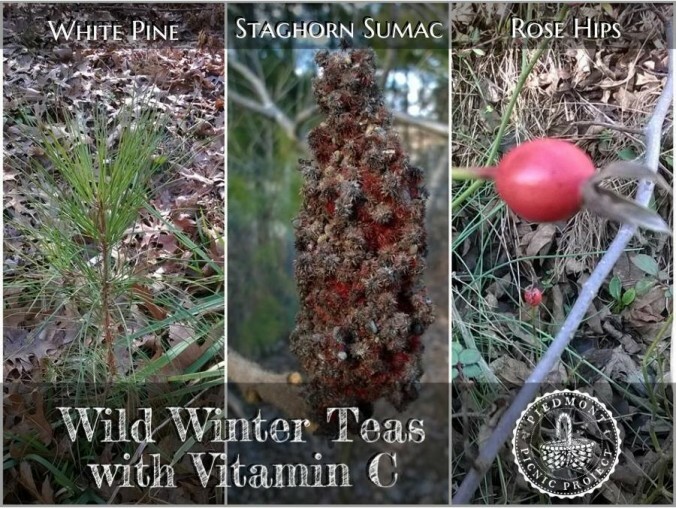 The three winter teas below are all excellent sources of vitamin C and can add color to an otherwise dreary cup! Drink them down to prevent scurvy or just to have a tasty, wintry treat! 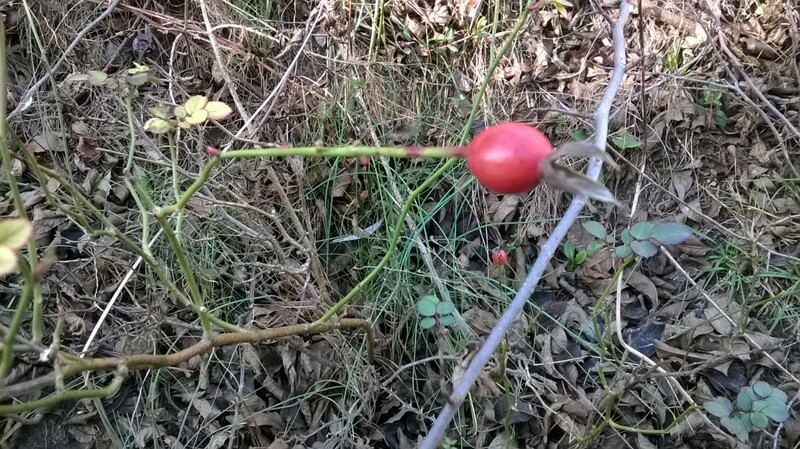 Description and Habitat: Rose Hips, the fruit of the rose plant, are often still on the plant throughout the winter. Look for a thorny bramble, with a few leaves still attached holding on to a round, red berry or hip. 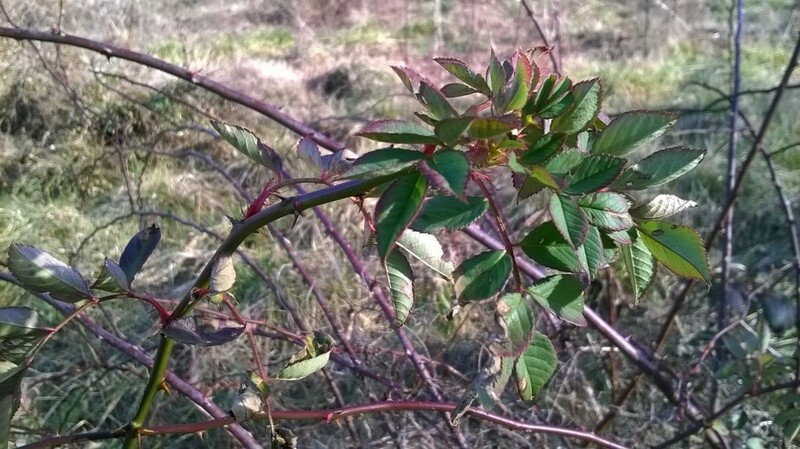 The rose hip will have a brown, leaf-like, five-part calyx at the top (see picture below). The leaves of the plant will much resemble your garden rose variety. The plants can be found along roadsides, at field or waterway edges, or along greenways (as this one was). Of course, you can also collect hips from your garden roses if they have them (some hybrid varieties these days do not). Harvest: Rose hips are available from summer through late winter. Harvest is easy here! Just pull or cut the hip off the end of the stem. You can then dry them or use them fresh. Flavor and Use: Rose hips are very tart. The longer they are on the plant, the softer and less tart they will be. This tartness is a good indicator of their vitamin C content. They can be used to make candies, syrups, jellies, or teas. See below for a full description of making tea from all three of our wild winter edibles. 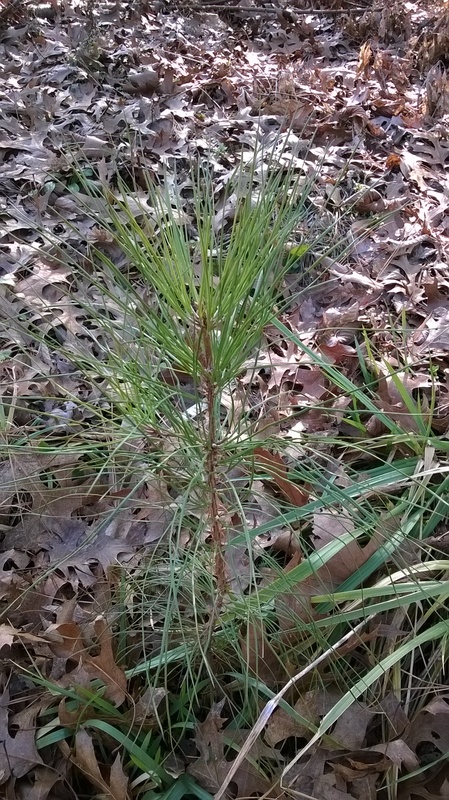 Description and Habitat: Several long-needled pine trees are common to our area, including Loblolly, White, Virginia, and Longleaf. 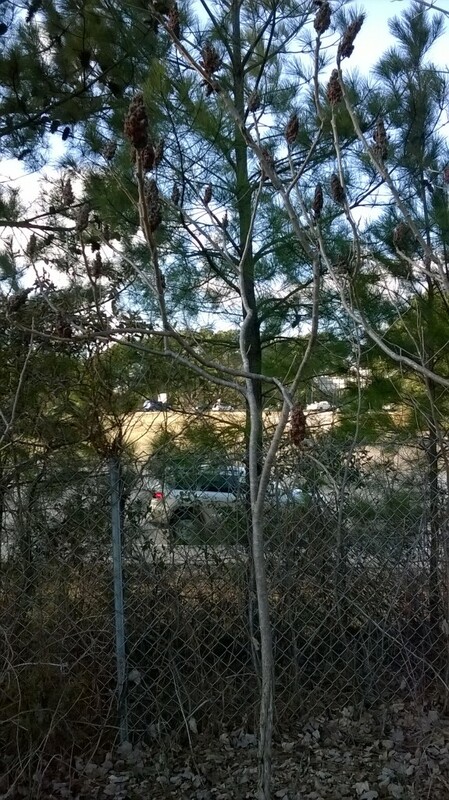 These are each cone-bearing evergreens very similar in appearance, starting as a small sapling like the one pictured below, growing into huge, towering trees. Smaller trees are preferable, as they are easier to reach. 😉 Look for clusters of long, green needles and a pine scent. They grow in forests, along roadsides, and along greenways in our area (as well as in people’s yards). Harvest: The lighter green needles at the tips that come out in early spring are preferable to the darker ones, but both will work just fine for tea. Cut or break off the tips. At this point you can dry them or use fresh. 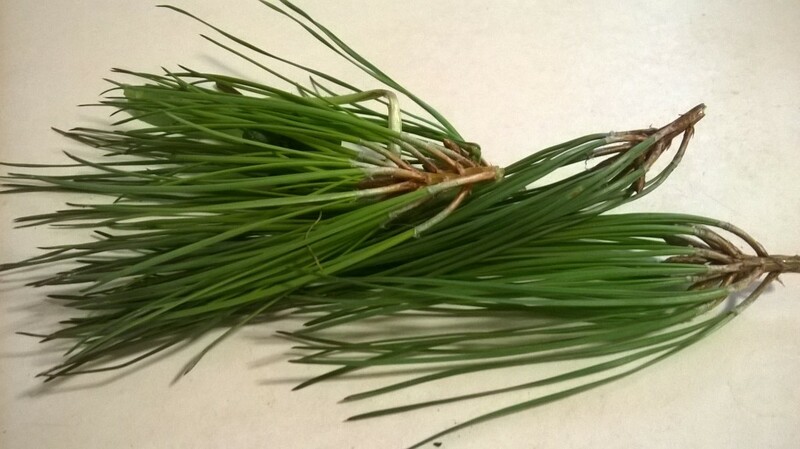 Flavor and Use: Pine needles taste much the same way they smell… that fresh pine scent. They are also high in vitamins A and C. There are many uses for various parts of the pine tree, but the primary use for the needles is to infuse their flavor in other things. Our post today is on making teas (see below), but they could also be infused in spirits or used in beer brewing. They could be used to smoke fish or meat. Get creative with them for anything you want that piney flavor! Description and Habitat: Staghorn Sumac can often be seen growing along roadsides and is also found at field edges and along greenways. The silhouette is rather distinctive in the winter, as you can see below, because each of its branches is tipped with a clump of berries. The berries are reddish in color and furry. 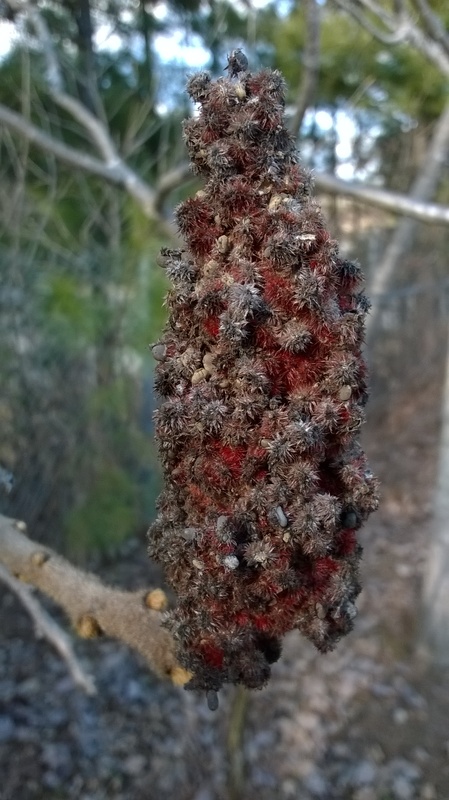 These berry clumps can be found from late summer, through the end of winter. They will have more flavor earlier in the season before much of it gets washed out by rain, but even now, they will still brew a tasty, yet weaker, tea. WARNING: You may have heard of Staghorn Sumac’s less-desirable cousin, Poison Sumac. Poison Sumac will give you an extreme version of what poison ivy can do to you if you come into contact with it. Luckily, the berries of the two look nothing alike, with poison sumac berries being white and smooth-skinned (very unlike the red, furry ones pictured below). Harvest: The entire cluster of berries can be snapped off the end of the branch and either used immediately or dried and stored. 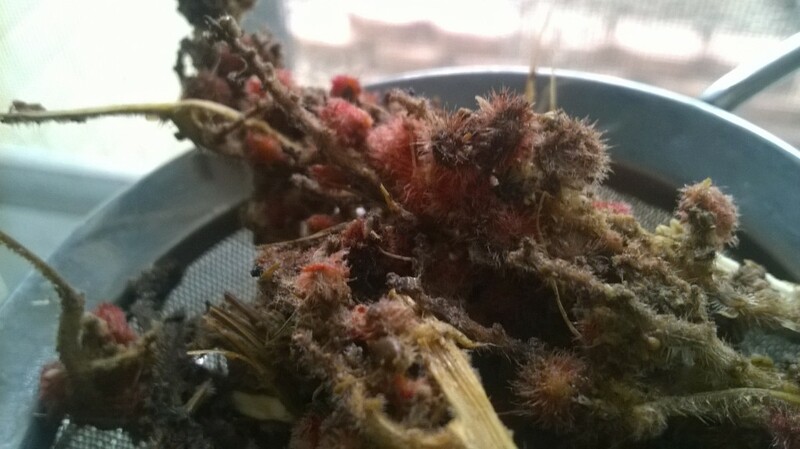 You can see the cluster below has been through a long winter, as much of the red color has already been washed out of it. Earlier in the season, the entire berry cluster would be red. 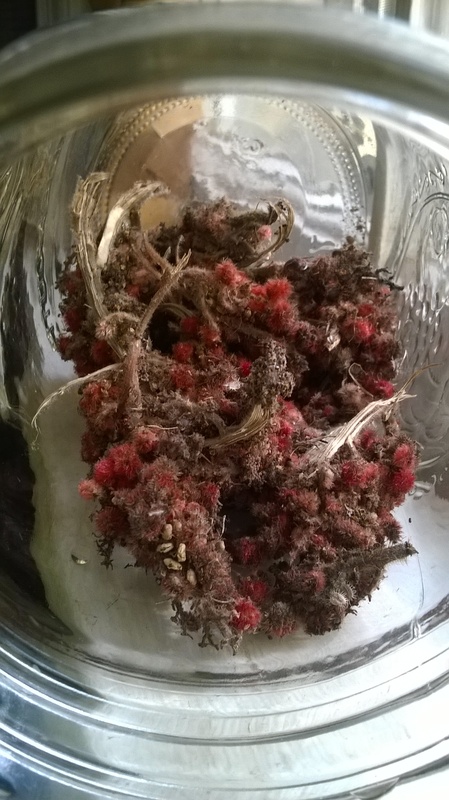 Flavor and Use: Staghorn Sumac is most often brewed into a tea and drunk hot or cold. It has a very tart flavor and a red color, so it is often used to make “wild pink lemonade” with no lemons needed. This tartness is an indicator of its high vitamin C content. This liquid could also be made into a syrup concentrate or jelly. Some people also crush the dried berries and use as a seasoning. See tea brewing instructions below. We’re using photos of the Staghorn Sumac for this (because, let’s be honest, it looks the coolest), but these instructions apply to any of the three wild edibles above. Tear apart or crush the plant roughly and place wild herb in a heat-safe jar or mug. Bring a kettle of water to the point of steaming, but not boiling. Pour contents over wild herb. 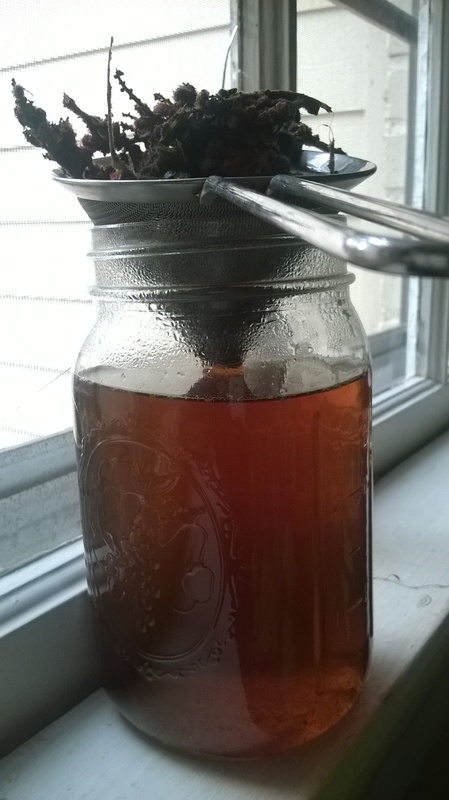 If you like a stronger-tasting tea, pour less; a weaker tea, pour more. Cover and allow to steep about 3-5 minutes. A longer steep may result in a slightly stronger, but also often more bitter flavor. Strain the tea through a fine-mesh strainer (a very fine mesh is particularly important with the Staghorn Sumac, to remove its tiny hairs). Feel free to sweeten to your liking with honey at this point, and enjoy hot this winter, or cold this coming summer! IMPORTANT SIDE NOTE: This is a good point to stress that (although this plant is very easy to identify) you should NOT eat any plant before you have positively identified it with a good plant guide (we recommend A Field Guide to Edible Wild Plants: Eastern and central North America (Peterson Field Guides)). The first time you eat it, it is best to only have a small amount so that you can be sure you do not have any adverse effects from it (which is probably a good idea with any food you are trying for the first time, even off a grocery store shelf! ).